Last summer John and I decided to do something a little different for our anniversary; we went on a cave tour. Truth be told, I think we may have been some of the oldest people there. It was clear this was not your typical 41st anniversary date. But, even though we were probably the oldest people in the crowd we weren’t the only ones who had to stop and rest as we ascended the 275 steps out of the cave. We had so much fun and I wanted to tell you a little bit about our day in case you’re looking for something fun to do this summer. You don’t have to quit reading if you aren’t from here. 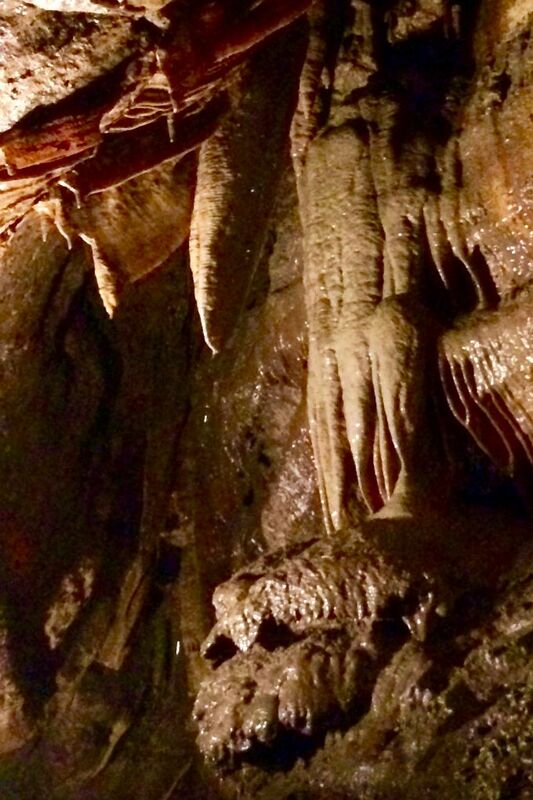 There will be plenty of pictures to give you a feel for Niagara cave. They might even entice you to come for a visit. 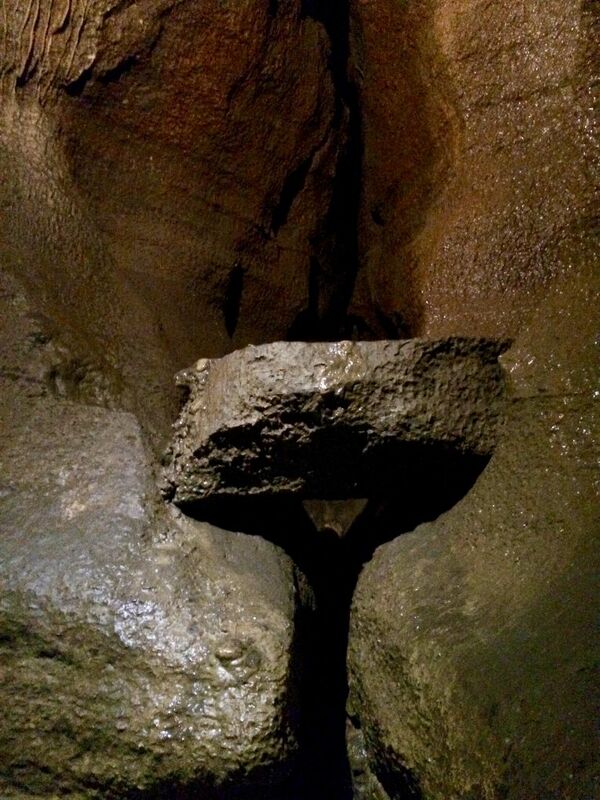 The Niagara cave is found in southern Minnesota just north of the Iowa border near the town of Harmony. There are other fun things to do in Harmony but let me first tell you about the cave. Back in 1924 three pigs were happily playing in a pasture when the ground fell out from under them. (I just made up that happily playing part. I have no idea how happy the pigs were but I’m fairly certain they weren’t happy after they fell into the sinkhole.) The pigs’ screeches led rescuers not only to them but also to the discovery of the underground tunnels now known as Niagara Cave. Being as it was on a privately owned farm the caves have always been a private enterprise. 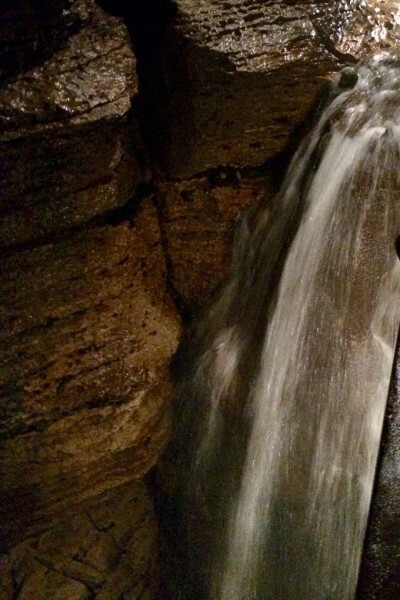 It was named Niagara Cave after Niagara Falls (which is another fun spot to visit, although not exactly a day trip) because of the 60-foot waterfall found inside. This is but a small part of the 60-foot waterfall. 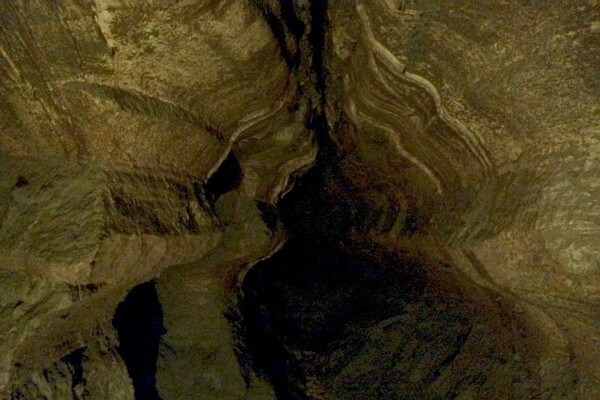 Currently Niagara cave is owned by the family who bought it in the mid-90’s. I had a chance to speak with the owner while we were there and he told me how he had hand carried cement down into the cave and mixed it with the water found therein to build steps and pathways throughout the caves. It’s a pretty impressive walkway that aids in letting people move throughout the cave but doesn’t distract from the natural beauty. I’m not certain he built all of the paths but he’s done quite a bit since he bought the property. Two of his sons currently help him with the running of the business. 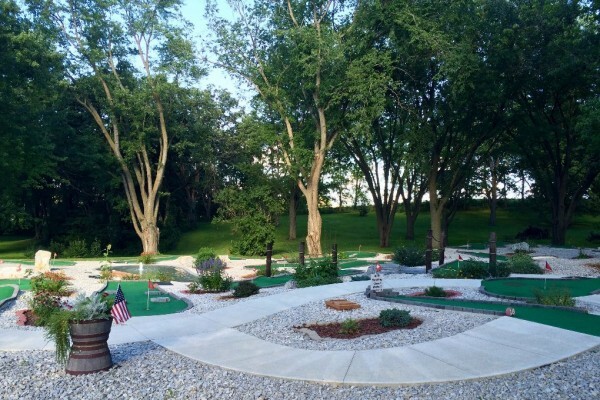 At the site there are also picnic areas, a playground, and the opportunity to do some gemstone mining. We did not partake in those activities but they would certainly be a fun addition to a family day trip. One thing to note about caves is they aren’t warm. Fortunately I learned that many years ago on a cave tour in, I think it was Oregon, so I was prepared. The temperature inside a cave is close to the annual average for the area in which it’s located. Around here that means it’s about 50 degrees. In other words, bring a sweatshirt. You won’t need much more than that because of the high humidity level and the energy you’ll exert going up and down steps and through the tunnels. Niagara cave is a pretty impressive display of beauty and has been named one of the top ten caves in America by whomever it is that makes that type of pronouncement. They’ve even deemed one area of the cave a wedding chapel, but truly, don’t expect great grandma to make it to the wedding if you plan it there. Unless she’s in great shape the stairs, and walk to the chapel, might be a bit much. But, if you’re really into caves the chapel will be perfect for your nuptials. 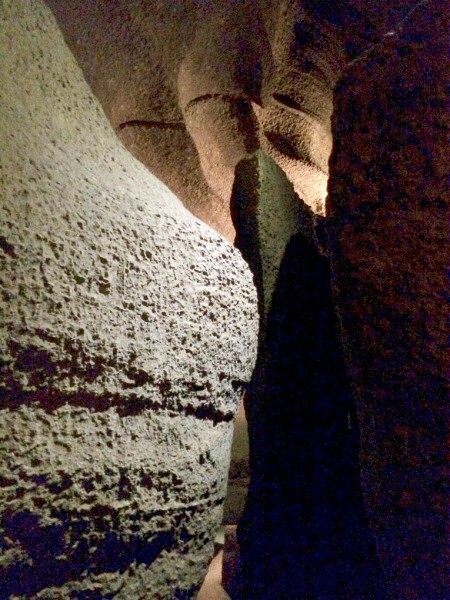 As with most cave tours, there’s a point where they turn out all the lights (unless someone in your group has a phobia about that) and let me tell you, you’ve never experienced that kind of dark above ground. I would have taken a picture, but well . . .
Once you’re done with your expedition at Niagara Cave you might want to enjoy more of what Harmony has to offer. We didn’t have time because we aren’t always good at advanced planning but when we go back I’d like to take in the Amish tour. On the tour you get to visit local shops and Amish farms either in your car with a private guide or on a bus. Personally, I wish I could get into a buggy and really get the whole Amish experience but it doesn’t appear that is an option. You could check out the trip advisor page for Harmony for more ideas but truth be told, unless you plan to spend the night, you’ll be out of time after doing the Amish Tour and Niagara Cave. But, there’s another cave close by if you’re feel particularly adventuresome. If you live in Minnesota and like caves, grab your family, or a couple of friends, and enjoy a day, or a weekend doing a little exploring in the Harmony area. If you don’t live here, I hope you enjoyed the pictures. 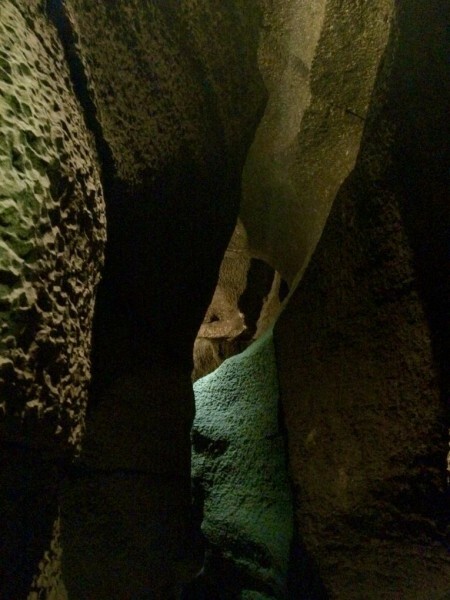 This entry was posted in Exploring the World and tagged Day trip, family fun, Minnesota, Niagara Cave on May 23, 2017 by Nancy. Nancy, I am one of your Mon’s friends. I met you once at Shirley Larson’s home when she honored you with lunch and a game of Mexican train. I have enjoyed today’s blog enormously. 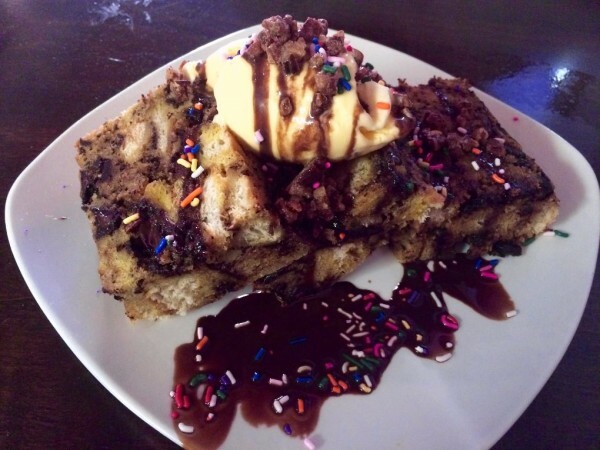 Your pictures are always fabulous! Thank you for including me! We went to the “other” cave (Mystery Cave) a couple of years ago as stairs can be a challenge for me. I’d like to take in an Amish Tour as well. Now that Dave’s out of school perhaps we can get around to doing some day trips this summer.